Keep updated on the latest trends in the Global Mobility industry by registering on Santa Fe Relocation's upcoming webinar. Join the discussions to hear insights and recommendations from Global Mobility experts. 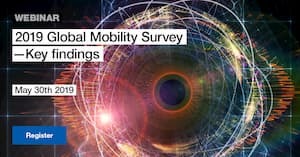 The key research findings from Santa Fe Relocation’s Global Mobility Survey 2019 (due to be published this Spring), will be shared and explored. • The future of Global Mobility. The full agenda will be revealed, once the report is published! This webinar is your opportunity to hear first-hand the insights from the authors of the report. It is designed to help HR and Global Mobility professionals drive and continuously improve the development of their Global Mobility programmes, and is part of Santa Fe Relocation's Global Mobility insights series. Your people are the life force that powers your organisation. So how do you ensure your people strategy is designed to compete for talented individuals across the globe? Don’t miss out on the opportunity to attend IBIS Academy 2019, presented by Gallagher. IBIS Academy a one-of-a-kind conference experience where you’ll learn, network and share knowledge with business leaders from around the world dedicated to providing solutions that make their workforce better. Mark your calendar to join fellow in-house HR professionals, along with select global service providers and industry experts, at the Rosa Grande Milano hotel on 8 – 10 May 2019. IBIS Academy is the longest-running global benefits and human resources conference of its kind, complimented by three specialty tracks designed for new global HR professionals (IBIS Institute); global employment lawyers (IBIS Employment Law Symposium); and global mobility practitioners (IBIS Mobility). For professionals with global mobility responsibilities, consider the IBIS Mobility track. This dedicated track offers the resources you need to refine your mobility strategy to better meet your current and future needs, and protect your organisation from the risks of managing a global workforce. Register today to secure your seat at IBIS Academy 2019! The UK employee benefits market has never seen as much change as it has over the last few years. Compulsory employer pensions provision (which began in 2012 under the guise of automatic enrolment) has affected all employers, while taxation changes, legislation targeting higher earners, and new ways of saving are all making the employee rewards space an exciting place to be. Alongside this, there’s an improving nationwide recognition of the importance of wellbeing both in the workplace as well as out of it. For this first article, we are concentrating on pensions, and their role in UK employee benefits. Read the full article here. Ahead of the Employee Experience for Global Enterprise, taking place in 22nd-23rd May, I wanted to share with our exclusive HR industry interviews. Our team caught up with Sander De Bruijn, Global Head of Employee Experience at ING and Bruno Santos, Head of HR from Cognizant. This article will provide guidance on the crucial aspects to consider, for example, how you should involve associates, and make them an active part of your organisation, ensuring that you gain a good insight into the problems affecting EX. Creating a social, mobile and consumer-style EX has become a priority as organisations inspire to an employee-centric workplace culture. We spoke with Ken Hubbell, Senior Vice President, Instructional Design Strategy & Innovation, where he discusses a number of digital tools and integrated platforms to evolve HR systems including automation, AI and blockchain technology. If you would prefer to receive a copy of these interviews via email, please contact us at enquire@iqpc.co.uk and we will send you over a copy. Exploring country-specific provisions for international assignees can be challenging for many global organisations. Although many companies agree that the days of a one-size fits all Global Long- Term Assignment policy are gone, and that no two global destinations are alike, they often struggle to maintain consistency and equity among their mobile population. Click here to read the full article. 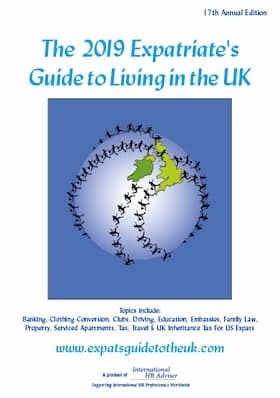 We have now published our 2019 Expatriate’s Guide to Living in the UK, which is a handy annual A5 Guide offering expatriates information on banking, driving, education, healthcare, immigration, legal issues, lettings, serviced apartments, tax and travel in the UK. A copy of this Guide was inserted into the spring issue of International HR Adviser, for your attention, but if you would like to order copies to pass on to your expatriates who are about to move to, or who have just moved to the UK, then please let us know. If you would like to place an order for these Guides please email damian@internationalhradviser.com. Let us know the quantity required and the address you would like the Guides sent to. Please note that for multiple copies, we may quote a small postage charge. The online version of the 2019 Guide is now available to view on www.expatsguidetotheuk.com - please feel free to share this website and/or embed it on your intranet site. The essential Guide to living in the UK that your expatriate employees cannot afford to miss!